The Boston Society of Film Critics announced a pretty commanding sweep for The Hurt Locker in their annual awards (Best Picture, Best Director, Best Actor, Best Cinematography, and Best Editing). However, while the BSFC doesn’t announce runners up, a source informs us that the Coen brothers’ A Serious Man, which ultimately took home only one award (for Best Screenplay), actually put up a pretty decent fight, coming in second in balloting for Best Picture, Editing, and Cinematography. 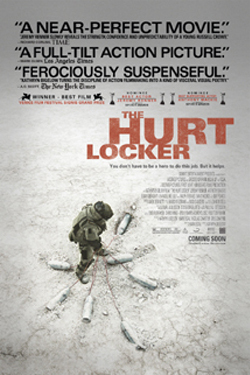 (The Hurt Locker was second in line for the Screenplay category.) But perhaps the best evidence of The Hurt Locker’s strength was that Kathryn Bigelow had almost no challengers to her Best Director crown; she won the award on the first ballot, which we understand is pretty rare for this group of critics. There was one tie: Precious and Star Trek both took the Best Ensemble award, with A Serious Man (again) as runner-up. Along with Bigelow’s director win, there were some other awards where the decision was more clear cut: Mo’Nique easily beat Up in the Air’s Anna Kendrick for Best Supporting Actress, and Up won Best Animated Film rather handily over The Fantastic Mr. Fox, says our source. One category where there was a bit of a split field was Best Documentary, which went to The Cove, although we’re told there were numerous other contenders, including Food, Inc., La Danse, Every Little Step, and Burma VJ. That said, our source informs us that most of the group was happy with The Cove taking home the prize. All in all, though, we’re told this was a pretty friendly session, and not particularly contentious; the voting apparently didn’t go to a third round on any of the categories. We’ll see if the same can be said after the New York Film Critics announce their awards on Monday.